Ryan Terry for Phys.org: We all lose our balance sometimes; we slip, we fall, we get back up. But for some, life is a balance beam, and merely walking around poses great risks of tripping, slipping or falling. Dr. Pilwon Hur, an assistant professor in the Department of Mechanical Engineering at Texas A&M University, has set out to help people with balance issues walk through life with ease. 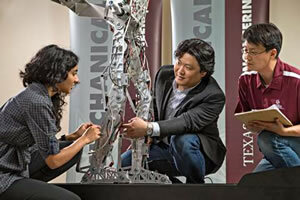 Using biomechanics and neuromechanics, Hur and his team in the Human Rehabilitation Group at Texas A&M are developing robotic prosthetics and therapy devices to restore balance to those who have lost it through injury, illness or age. Hur's prior research helped him answer two questions: "Can we predict a fall? Can we then reduce the number of falls?" The data he gathered from test subjects, which he put into his own mathematical model, led him to conclude that a person's fall risk could be predicted.